Purchasing Buzzsaw CD Ripper is secure and easy. Click "Buy now" and you will be directed to a secure page where you can purchase a license code. Once you complete your order, your license code will be emailed to you and will unlock the trial version of Buzzsaw. 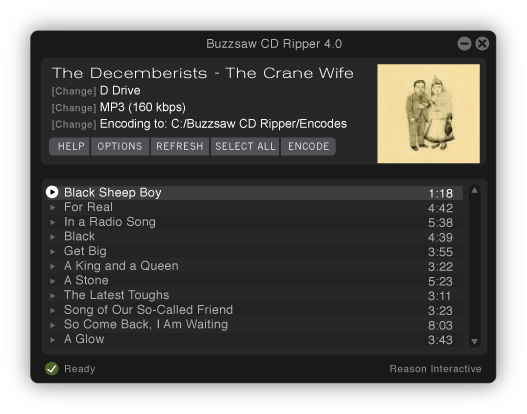 If you have not already done so, you may download Buzzsaw CD Ripper here. RegNow offers a secure connection for safe online orders. The order process is protected through a secure connection. Your personal data is encrypted and cannot be accessed by a third party, so you can rest assured your order is safe and secure. After you receive your license code, start Buzzsaw CD Ripper. Click "Purchase & Unlock Buzzsaw." Enter your license code and you may continue using Buzzsaw CD Ripper. Immediate download for only $30.00.